SUNNY BRAE – On Wednesday, Oct. 19 at 7 a.m., officers from the Arcata Police Department served a search warrant on a residence in the 1400 block of Buttermilk Court. The warrant was in response to information that the resident, who is on active parole, was engaged in drug activity and in possession of possible stolen property. 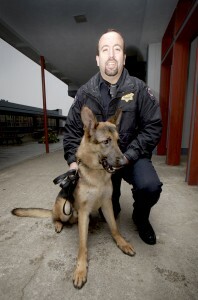 K-9 Officer Bronco and Officer Greg Pope. Upon entering the home the suspect, 33-year-old Zachariah Friedland, fled out the rear of the residence and onto the roof. When spotted by officers he jumped to the roof of a neighboring home and fled on foot. Deputies from the Humboldt County Sheriff’s Office and officers from the Humboldt State University Police Department responded to assist. A perimeter was established and an Arcata Police Department K-9 unit was deployed. Officer Greg Pope and his K-9 “Bronco” immediately located a scent path and lead officers to the location where Friedland was hiding, which was in heavy vegetation. Friedland, who had sustained a broken foot while jumping a fence, was taken into custody without further incident. Friedland was treated at Mad River Hospital and then booked into the Humboldt County Correctional Facility for felon in possession of ammunition, possession of burglary tools, probation violation, possession of a controlled substance, possession of concentrated cannabis, possession of drug paraphernalia and resisting arrest. This entry was posted on Wednesday, October 19th, 2011 at 1:47 pm	and is filed under News. You can follow any responses to this entry through the RSS 2.0 feed.